KVS TGT PGT Results 2019: Kendriya Vidyalaya Sangathan (KVS) has conducted the TGT, PGT, PRT written test on 22nd and 23rd December 2018 respectively. Aspirants wishing to get teaching and non-teaching posts in KVS have competed for the written test round. The organization unveiled the answer keys for the TGT, PGT, PRT, Librarian and other papers on its official website, kvsangathan.nic.in. All the competitors who have competed for the test can check the answer keys and estimate the score. Candidates competed for KVS exam and waiting for the result can wait for few more days to download the result. KVS is likely to release the results soon on its official website. Hence the aspirants competed for the test can stay checking the KVS portal on regular basis to check the result, cutoff marks, and merit list. In this article, we have mentioned the relevant updates regarding KVS TGT, PGT, result date, cutoff marks, and other details for the reference of aspirants. Kendriya Vidyalaya Sangathan (KVS) will be releasing the result of recruitment exam conducted for PGTs, TGTs, TGT (Misc. Category) and PRT posts soon. Once the result is declared, the candidates can obtain the same from the official website of KVS- kvsangathan.nic.in. Kendriya Vidyalaya Sangathan (KVS) is the central government educational organization that spread in many areas across India. The KVS schools offer quality education for the students with an attractive curriculum. Every year, KVS come with certain recruitment notifications to fill up the vacant positions in various branches. This year the KVS has drafted a recruitment notification for a large number of posts. It has announced 8399 posts for PGTs, TGTs, Primary Teacher, Librarian, Principal, and Vice-Principal for the year 2018 – 2019. Many of the competitors having the suitable eligibility have applied for the announced posts during 24th August to 13th September. The organization received lakhs of applications from interested and eligible aspirants for the TGT, PGT and other posts. Selection of candidates will be done through written test, interview rounds. Candidates have to clear the selection tests to get the job in KVS. All the competitors who have come across the TGT and PGT examination on 22nd and 23rd December 2018 can expect the result in January 2019 (Tentatively). Usually, the organization will release the results within 3 to 4 weeks after the examination completed. Hence the result is tentatively released in 3rd or 4th week of January. The competitors required to stay patient until the result date is revealed by KVS. Cutoff marks/qualifying marks to be scored by the competitors to clear the written test round. The cutoff marks will be announced category-wise (general, OBC, SC, ST, and others). Candidates have to score the minimum qualifying marks as per the announced marks. The candidates who cleared the exam with required marks will have the chance to proceed with the next rounds. KVS is going to announce the cutoff marks along with the result. Also, the merit list of the qualified candidates will be revealed at the time of results. Hence the aspirants advised to stay patient and keep checking the KVS website to check result, cutoff marks, and merit list. 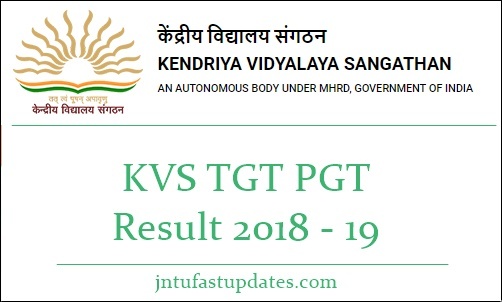 KVS TGT PGT Result 2018-19 are declared, Check from below. On the homepage, you can find the Result link. Click on it and specify the required login credentials. KVS TGT PGT Results 2019, cutoff marks, and merit list will be displayed on the screen. Check the result and check whether qualified or not. Take a printout of the result for further reference.